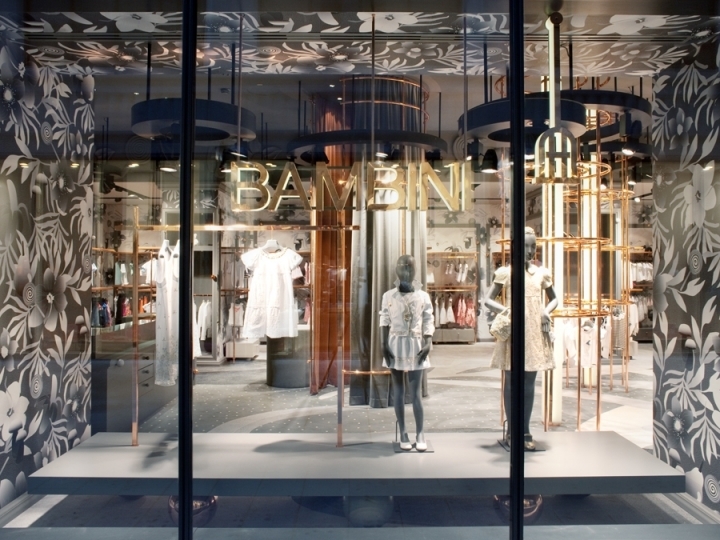 Bambini is a boutique for children’s high-end fashion in Vienna. 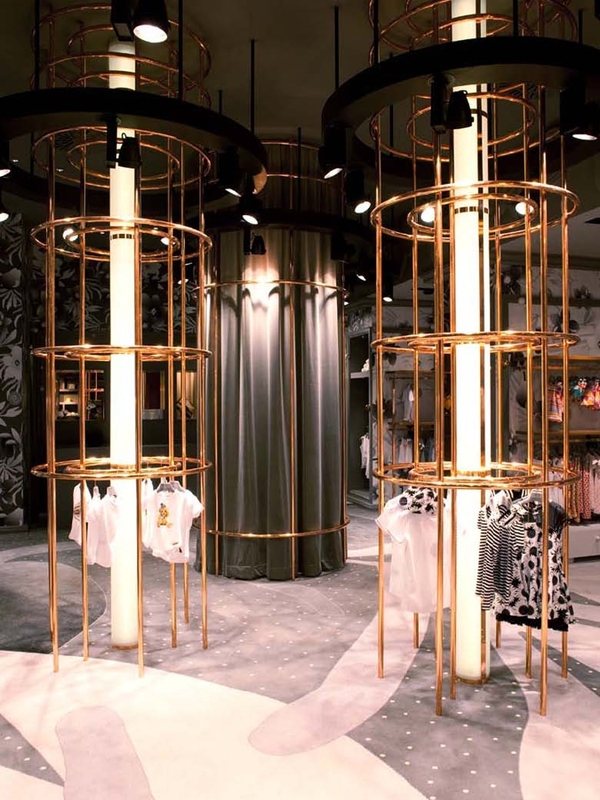 The interior was completely custom-designed by the Viennese designer Denis Kosutic, in collaboration with Marieke Kuchenbecker and Carina Habert. 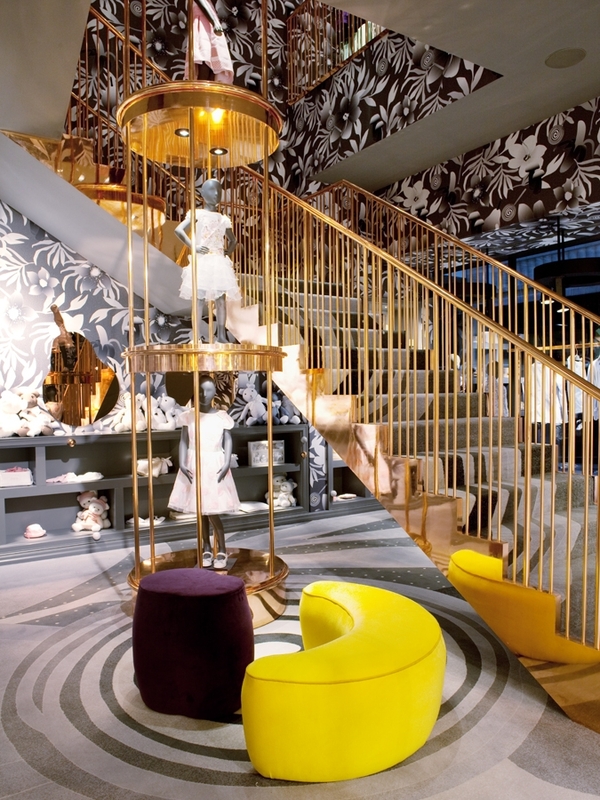 Kosutic took inspiration for the interior from nostalgic associations from black-and-white Hollywood movies and fairy tales. 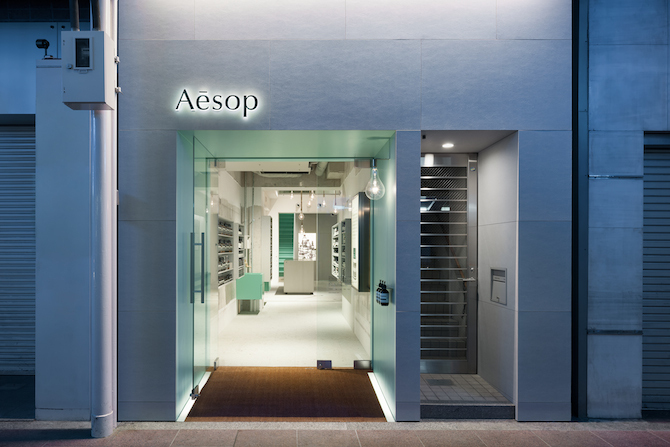 The 360 m2 multi-level store is drenched in a monochromatic backdrop of grey, black and white, including a floral wallpaper and carpet, displays units, drapery and furnishings. 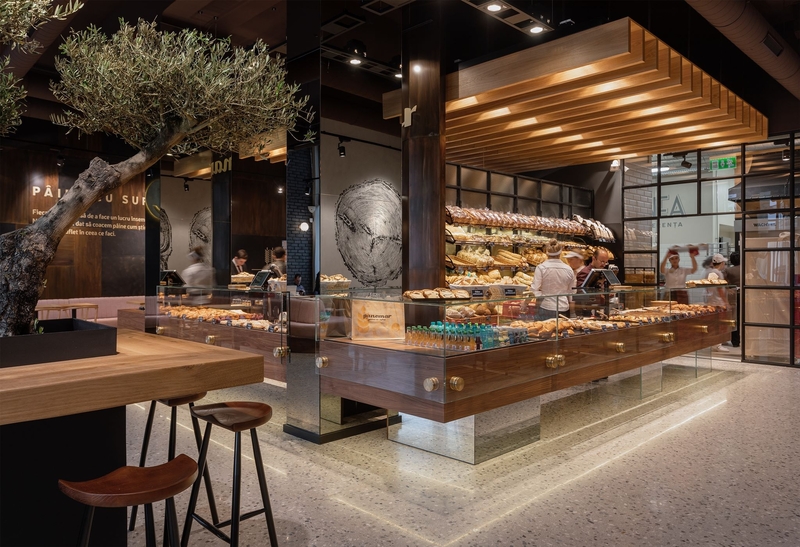 The dreamlike space is enlivened by bursts of colour seen in the customised seating furniture, like the bright yellow bananas and vibrant red mushrooms. The surreal flower pattern, designed exclusively for the shop, spreads out across the entire room, using different levels of brightness and varying scales – small size on the wallpaper and supersize on the carpet. 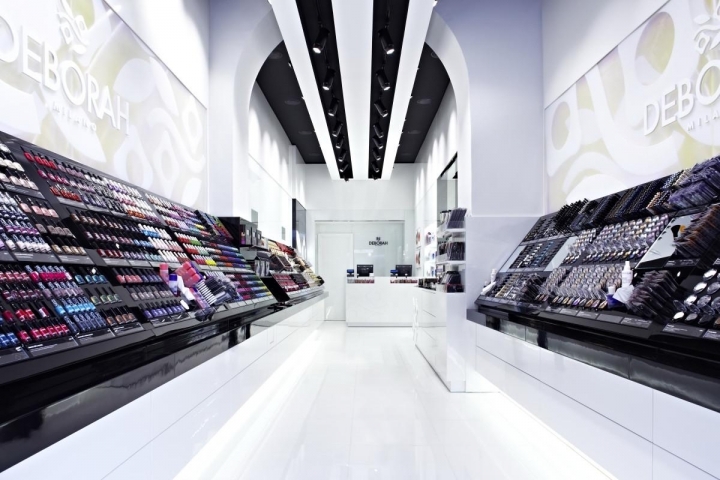 Classic grey wall frames define the merchandise presentation areas. 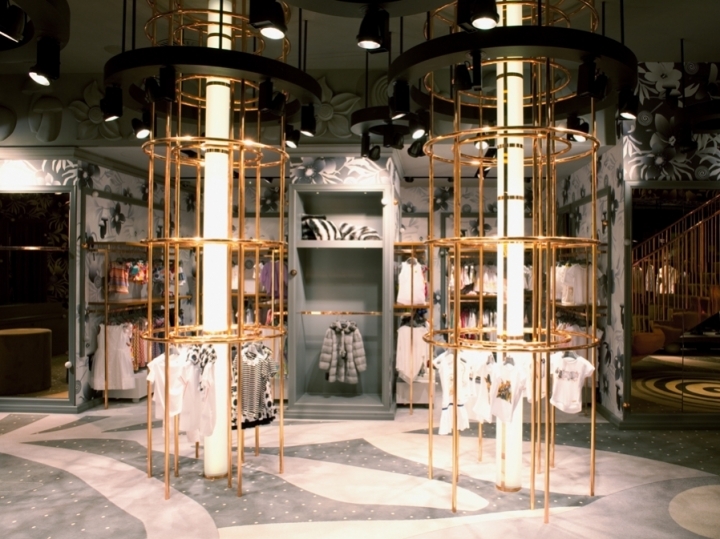 Cage-like pillars made of copper tubing create the central displays. Thanks to their strong sculptural effect, illumination and backlighting – as well as their free positioning – they come across as mysterious objects, taking the beholder by surprise. The gleaming copper has an exciting and particularly elegant effect on the matt grey and neutral patterned backgrounds. 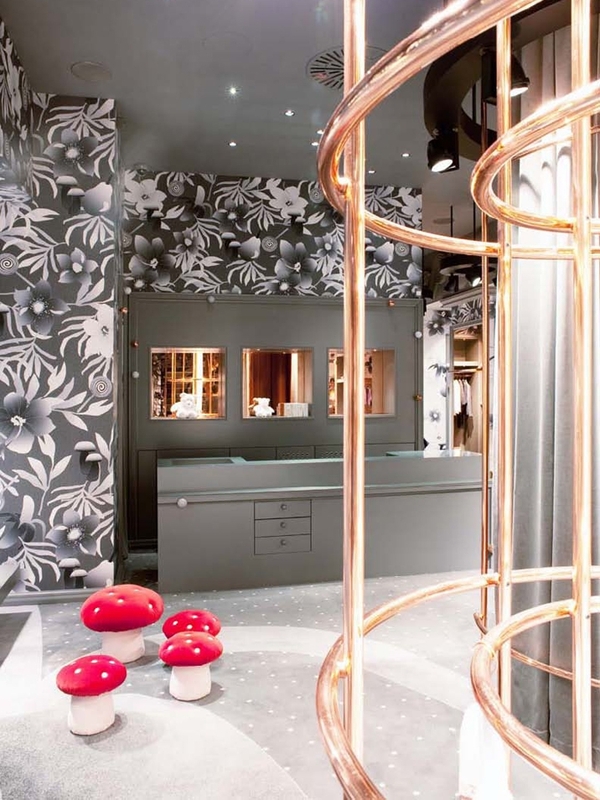 Surreal objects, such as a plaster frieze of supersized mushrooms, lollipops and pears and fruit-shaped mirrors along the walls, as well as the colourful furniture, have been added to support the fairy tale-like atmosphere.